I have downloaded a course I'm doing which has come as a compressed zip folder with MP4 files in it. Many of the MP4 files open to play in WMP with no problem. But other MP4s come up with an error message "The destination path is too long. Rename the compressed zip folder and try again." However, when I 'right click' there is no option to rename. The name of the MP4 files that have this error message are no longer (and in fact sometimes shorter) than other MP4 files that open perfectly OK. I have found a way around this by copying the MP4 into the 'video' folder and they then play fine. But I am puzzled as to why I am getting this message for some and not others. Just to add to the confusion, I downloaded KB4462923 yesterday and when I played the first MP4 this morning I noticed a prompt when I opened WMP to select 'standard settings'. I don't recall having the difficulty open the MP4s before the downloaded KB update. The KB update had been sat there unchecked for a week or so. Yesterday is appeared with a tick, so I assumed problems had been ironed out and it was OK to install. There is a way around this for me, but I would like to know why this is happening for some MP4s and not others and whether the KB update has caused this? I have downloaded a course I'm doing which has come as a compressed zip folder with MP4 files in it. Did you unzip the file that was downloaded first using something like 7-Zip? Do you have the same problem if you use VLC [FREE]? It pretty much plays anything you throw at it audio and video wise. Here is the official direct download link => VLC Media Player. No I didn't use anything to unzip. I'm not a fan of downloading software. They were all playing nicely on their own through WMP. Been viewing for a few weeks with no problem. Only have experienced difficulties after downloading the KB ...23 update yesterday. Whatever was in that update re-set WMP as it asked me to select settings this morning, and have had problems after that but only with some MP4s and not others. You need to unzip the folder. Download and install 7Zip. It's free and will get the job done. 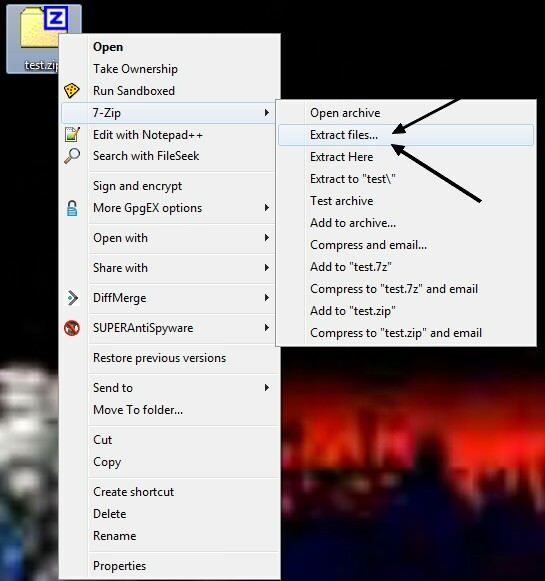 Once installed right click the zip folder and unzip. Or use PeaZip Portable if you don't want to install anything to the HDD permanently.